Filled with energy, loud beats, vibrant artists and passionate fans, a Hip Hop concert is a great experience, both for people who are fans of the music genre, as well as for people who are just trying it out. While Hip Hop music might be fun to listen to on your iPod, a concert is a more vivid and interactive experience, with the audience playing a direct role in influencing the performance. To begin with, make sure you dress comfortably. A Hip Hop concert is not the sort of event where people sit down in their designated seats and listen politely to the music – it’s packed to legal capacity, and everyone is standing. For most of the duration of the concert, expect to be standing, and if it’s really good, you will most probably be jumping up and down crazily, so make sure you wear loose, comfortable clothing. Just before you leave for the concert, make sure you grab a bottle of water, or buy one right before you enter the venue. Hip Hop concerts are high energy, not just for the artists, but for the fans too. Therefore, make sure you have a bottle of water handy so you can stay hydrated and avoid a fainting spell. In addition to having water on hand, make sure you avoid fizzy soda, alcohol and other hard drinks, as these lead towards dehydration. Now, make sure you have your tickets, and get to the venue early. Hip Hop fans are passionate about their music, so don’t expect to be able to find any space or be admitted if you turn up late. Besides enabling you to get a good spot in the arena, getting there early will also allow you to get information regarding the best after-parties, and you might even get to see the end of an artist rehearsal. During the concert, loosen up, have fun, and let out your inner crazy. 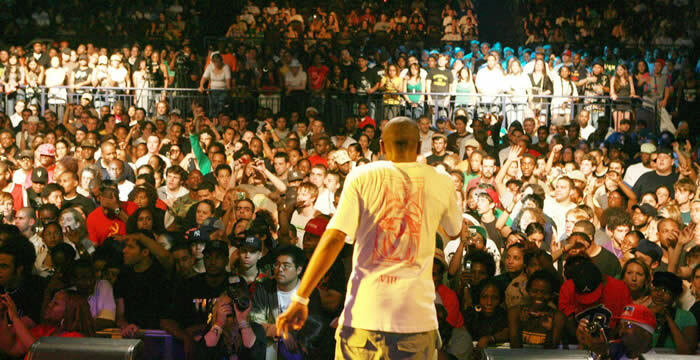 A Hip Hop concert is no place for uptight behaviour – most of the fans will be looking to go wild and have a great time, so go with the flow and energy of the crowd. Jump up and down, sing along with the chorus, and have a great time. However, make sure you also appreciate the depth of the lyrics and music – Hip Hop is often a commentary on society and the world around us, so look into the hidden meanings behind all the wildness.